aren’t u jealous;) what a blast i had tonite. Not only was the new showroom gorgeous with beautiful design and functionality (hello? solid stainless island, I’m in love!) – but I’ve been dying to check out LudoBites and was never able to get in. But tonite – I not only got a pic with Ludo but also experienced his creative and beautiful culinary bites that almost had me becoming a stalking fan/groupie. What a coincidence. Me – a small aspiring chef with bold but healthy flavors of “perfect umami bites” and Ludo – LudoBites:) I’ll save my soap box and dive right into the menu. I had to be one of those crazy, star-struck fans who took pictures of everything, checking out his knives, kitchen gadgets…isn’t his cutting board cool? Where can I buy one of those?? 2. 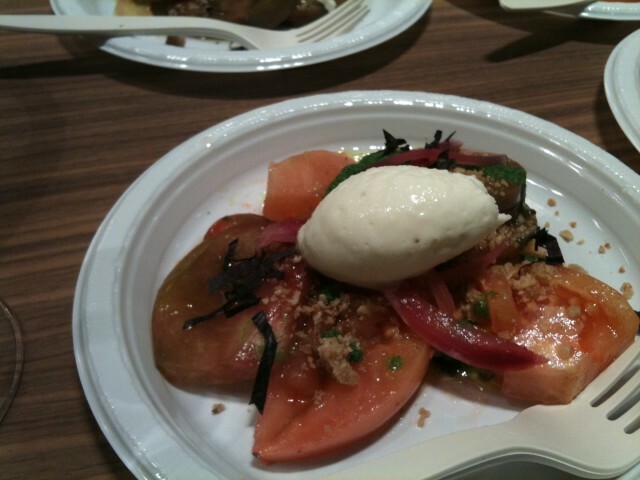 Ludo’s version of caprese with heirloom tomato, oatmeal parmesan, purple basil and mozzarella ice cream. Heaven! Just the right juxtaposition of umami, sweet, salty, creamy and crunchy. How did he do that mozzarella ice cream? 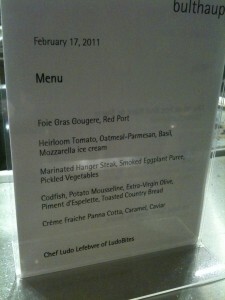 I give you props Chef Ludo – that was pretty original. 3. The star of the night – the hanger steak with smoked eggplant puree and pickled vegetables. The hanger steak? 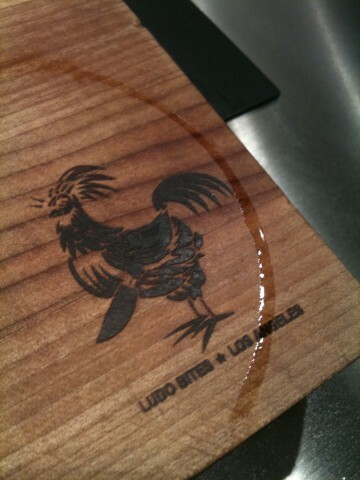 I had to ask Ludo – how did you marinate it? It’s freakin’ awesome! He says (in his leeetle french accent) – “I poot a leetle soy sauce, geenger, zum sugar, you know, a KOREAN marinade but weeth zum other stuff” – his secret ingredient, I’m sure. It was so tender and perfectly seared, not too salty and plenty of flavors that went beautifully with the pickled radish and cauliflowers – which were sliced so thinly that it took you a while to figure out it was cauliflower. I could eat that by the jar. The fatty umami meat cut with the crunch and the acid of the pickled veggies and balanced by the bitter eggplant. Beau-ti-ful. (No pix:( None to show you cuz we ate them all – but promise they were supreme). 5. 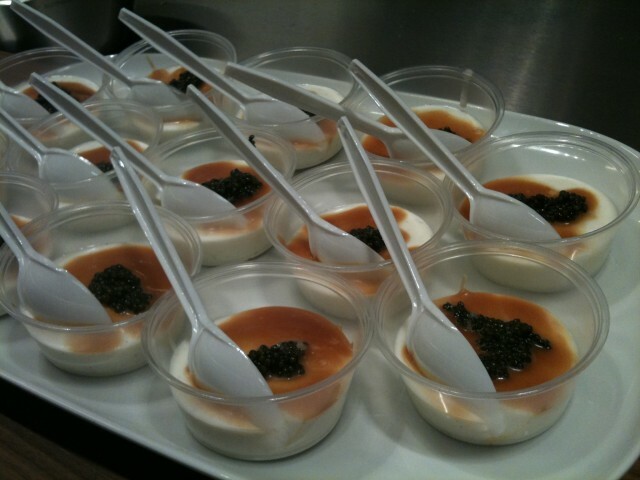 Creme fraiche panna cotta with caramel and CAVIAR. Who would have thunk it? and I don’t even like caviar (I may be the first to admit it but there. I said it). 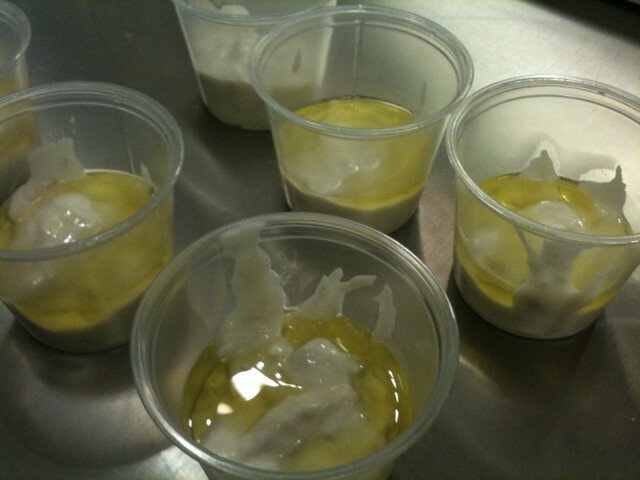 But t’nite makes me wonder if I’ve just had bad caviar as the combination of the firm, sweet panna cotta with the salty/sweet/smokey caramel teased or cut with the salty caviar – that was simply brilliant. 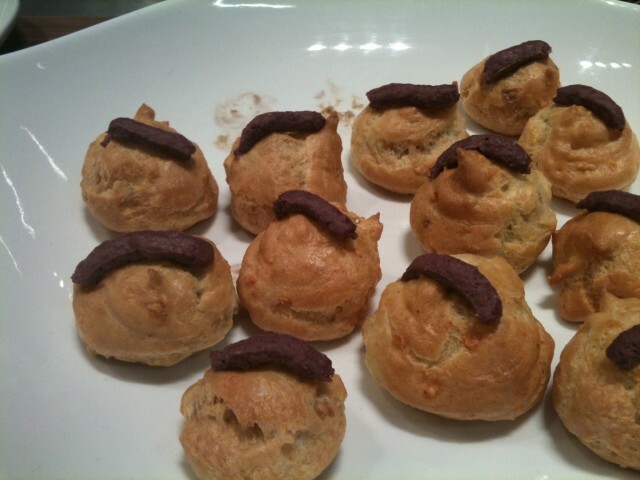 In retrospect – I think it could have used some crunchy texture but it was a pretty beautiful cloud nine. You’ve made me a fan, Ludo – and can’t wait to taste your new culinary creations at the next Ludobites~ Thanks for the inspirations and much thanks to bulthaup for making it a wonderful nite. This entry was posted in All things foodie related, becoming a chef and tagged bulthaup, bulthaup la, bulthaup showroom, caprese, foie gras, hanger steak, ludo lefebvre, ludobites, panna cotta, pickled vegetable. Bookmark the permalink.